Last week we sat down with Master Grower, Shlomo Booklin, Braingrid’s Cultivation Expert, to learn a bit about his techniques that have made him so successful in the Cannabis industry. 1) Shlomo, what is your background and experience as a horticulturist? I grew up in Jerusalem and studied agriculture. I was lucky enough to work for some very large companies in Israel. After a number of years, I moved to Australia and managed a large flower operation. I stayed in Austraila for about three and a half years exporting cut flowers to Japan. After that, I moved to Portugal where I managed a facility that exported young plants to Europe – mostly Poinsettias. We did an average of six to eight million plants every season which translates to 250,000 plants per week. I had to arrange to ship a month in advance, so I had to order the truck weeks before I had the plant in the ground meaning everything had to run like a Swiss clock. In 2002 I moved to Canada. Initially, I worked in a couple of big facilities in B.C. They were about two and a half million square feet of glasshouse growing flowers. In early 2014 I was approached by one of the first LP’s in Canada. They wanted someone that had experience with large-scale facilities to turn the facility into a more modern operation. I helped them design the irrigation system, layout and SOP’s (Standard Operating Procedures). I then moved to Toronto and joined MedReleaf. I designed a new irrigation system and switched them from normal, very expensive fertilizer to rockwool and a custom recipe, reducing their costs from thirty thousand dollars a month to about two thousand dollars a month! I did that for a year before I became a consultant, working with many new LP’s in Canada, Colombia, Portugal and Greece. 2) What are some of the things you look for that result in a successful high-yield high-quality outcome? It’s a combination of a couple of things but you must have a good strain from excellent mother stalk to start with, and it can’t be susceptible to disease or powdery mildew which is one of the biggest problems in the industry. Newer and more sophisticated commercial methods are also key like control systems and fertigation systems while collecting and monitoring data will increase the productivity, yield and of course the quality. Consistency is something that is really lacking and it’s critical, especially for medical cannabis. Yield and quality are important but equally important is consistency – harvest after harvest. Once we have established a good way to grow we will make it into an SOP which will help tremendously in maintaining the consistency level and lead to branding which puts a grower ahead of the competition. But if we look at it from the medicinal standpoint, consistency with the right balance of CBD, THC, CBN and terpenes is definitely something that is critical when you are treating a specific condition. The levels need to precise. It isn’t a fine art – it’s a science! 3) How do you manage the timing of the harvest? You need to follow strict SOP’s which lets you know that this particular plant is supposed to be harvested on a specific day. You can be accurate within a day or two. That enables you to plan your production schedule. I think most of the growers who calculate what the yield potential is and divide that by the days of operation they will recognize the value of each day lost in the production. It can be anywhere between $10,000 dollars a day to $50,000 dollars a day. It’s a lot of money. 4) So you touched on a number of things. One is the time it takes for harvest, second is repeatability and the third is collecting information so that you can achieve that repeatability. What are some of the things you need to maintain a consistent harvest? The idea would be to get between five and six harvests in a year. I personally like to work with cultivars that are eight to nine weeks. I can predict timing within a day or two window. 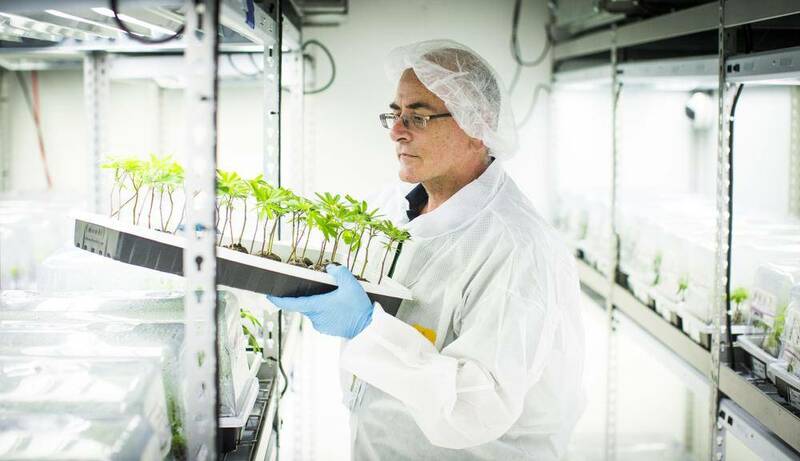 The second thing, obviously, is collecting data during the growth cycle so that you provide the plants with the right recipe of food depending on the cycle of the grow. Each stage requires different temperatures, humidity, CO2 and different frequency of watering and fertilizer regimes. So, once you track all that data and you have it quantified it’s almost like a mathematical graph, you can execute. It’s easy to repeat because you’ve established that on day 25 you have to give, let’s say 1500 ppm CO2, and a specific recipe to fertilize etc.. it’s only a matter of repeating the same thing, again and again, cycle after cycle after cycle. That is the key to success! In part 2 we touch on variable risks, measuring quality, and optimizing a grow with data!